Let me set the scene for you, as this is one of the crazier things to ever happen in sports. Brett Favre, golden boy of the golden NFL franchise leaves town on horrible terms. He then plays an inconsequential year on a team that goes nowhere, and doesn’t even make the playoffs. Rather than ending on a good note, he hangs up the cleats to spend some relaxing years in Mississippi riding around on his lawnmower or whatever. Then the Vikings come calling, needing someone to be the final puzzle piece for a team that has higher hopes. This team needs him, and he ends up signing with the enemy in epic fashion. As if that isn’t enough, Favre then wins both games against his former team, putting up seven touchdowns and two great performances. Uncanny, to say the least. It’s almost like Derek Jeter signing with Boston, coming back to Yankee Stadium and hitting seven bombs during a red sox sweep of the season series. That’s how crazy this comeback tour is turning out to be, especially after playing the game of his life on newly christened enemy ground. To think, after all the media circus, after all the hoopla, and spending his first game in the visitors locker room, Favre showed that 40 means nothing to a guy that lives, eats, and breathes football. Of course, Favre did have a lot of help from electrifying rookie Percy Harvin, and workhorse Adrian Peterson . . . which makes the Vikings fan in me incredibly happy. Harvin blew the Packers’ special teams to shreds, including three kickoff returns for 40 yards or more (not to mention as well as a ridiculous 51 yard TD to silence the fans in Lambeau). Peterson had as good of a day as Harvin, rushing for close to 100 yards and a score, in addition to catching a pass that pretty much sealed the game for the Vikings. When a player like Favre is surrounded by talent like Harvin and Peterson, the sky is the limit. The Vikings already have seven wins under their belt, and Favre has not had the injury bug of previous years. He is playing like he was at the top of his game, achieving the highest QB rating of any Minnesota quarterback since 2000. The scariest thing about all of this? The guy is old enough to be my father. In fact, Percy Harvin wasn’t even in grade school when Favre started his run in Green Bay 17 years ago. As if you need any more convincing, the Vikings haven’t swept the season series with Green Bay since Rodgers was drafted in 2005, and during that year, there wasn’t much else to be proud of. After four long years of QB mediocrity since that point, they finally have a poised field general to lead them, and each player is made better because of that fact. Let’s not forget that throughout his career in Green Bay, Favre was always the focal point of the Packers’ offense. None of the receivers around him were superstars, and most of the time, he was forced to carry them himself to any victory they were going to get. In Minnesota, Adrian Peterson is the man, and he can do just as much damage as any player taking the snaps. Luckily for Favre, that means that he can just play to his aged frame’s strengths, making safer passes, protecting the football, and relying on the players around him. In all reality, the Vikings are going to have a tough run at it, even with the “Silver Fox” at the helm. Teams like the Saints, Eagles, and Cowboys all have the weapons to exploit the Vikings weak secondary during a meeting in the playoffs, despite the fact that the QBs will have to deal with the Williams Wall, and Rodeo Wrangler Jared Allen. 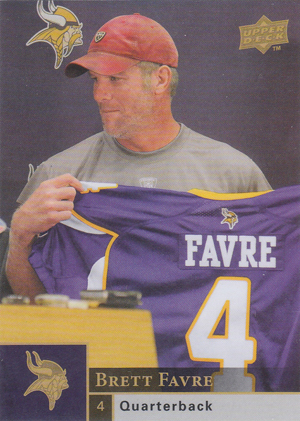 When it gets to that point, Favre may have to transition back to his old self, with the team on his shoulders. It could be especially bad competing in an older body that just played through a grueling season, going up against the best teams in the league. But if the win says anything, it’s that Brett can handle the pressure, which brings a new type of confidence to a team known for choking on the national stage. As a Vikings fan, I am having the ride of my life, and I will be the first to say that the confidence has made me a different fan. I can only imagine what it must mean for rookies Percy Harvin and company, knowing that you will always have a chance to win the game when Favre is on the field. Is the Michael Vick of Old Back?